Oops - we don't appear to have a video for the MobileOffice D412. The MobileOffice D412's is a color, duplex, sheet fed document and card scanner capable of scanning an 8.5 x 11.7” page in 4.6 seconds. The compact design and flexible dual power configuration enables the scanner to be used in the office or with your laptop on the road. The innovative design of the MobileOffice D412 focuses on ease of use. 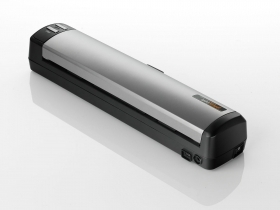 The scanner features a unique paper ejection mechanism that allows scanned pages to be ejected from the front or the rear of the scanner. User maintenance is simplified by the clamshell design providing easy access to the transport and imaging system for cleaning. Two single touch buttons and DocAction allow you to scan documents and create searchable PDFs at the touch of a button. The bundled application suite allow you to create searchable PDFs, scan and recognize business cards, create editable Microsoft Office documents and manage image files. Every Plustek scanner including the MobileOffice D412 comes with industry standard TWAIN drivers. These drivers ensure compatibility with thousands of image enabled applications, vertical applications, forms processing, document scanning and document management solutions.